I recently took a list to Lock and Load Masters and did quite well with it, and in the last few weeks since the event there has been a lot of discussion in various Trollblood communities about the list. I have stayed out of many of these conversations because Facebook is a terrible place to disseminate information and have it easily found in the future, and I always knew I would end up writing this article sooner or later. I'm going to discuss a few main points today, but there is far too much to talk about with the list than I can reasonably discuss in one article and until you put it on the table and try it out you will be missing out. Traditionally into a list with four really relevant models, the answer is to simply run at them with infantry and jam them into uselessness. That doesn't work at all with this list, and the War Wagon is the reason why. First of all, it has Dual Attack, meaning it is always going to be shooting an 8 inch spray and an AOE 5 quake gun, regardless of if it is in melee or not. More importantly, it has the rule Crushing Weight, which means that it does not have to move 3 inches to make impact attacks with the mount AND it can make multiple series of impact attacks. Couple that with Trampling Hooves which gives those impacts an additional dice to hit and the Knockdown effect on the mount, and you have a model that hits most DEF 16 and lower infantry easily, ignores most tough effects thanks to the Knockdown on the mounts, and can bowl right through a huge number of models a turn, be relevant on scenario, and get the quake gun deep into enemy lines with ease. Look out for models with steady and tough, as those are the models that will actually cause your engines to stop functioning properly. There are lots of other reasons why the War Wagon is fantastic, but those three rules are the most important ones on its card, and they're a big part of the reason why this list works. The next thing I'd like to talk about are a few of the more controversial/underused models in the list. First, the Sea King. There have been innumerable people asking if they can throw the list together and substitute a Glacier King or Mountain King for the same effect as the Sea King. The short answer is no. The longer answer requires a bit of understanding about the matchups that I want to play this list into. Typically speaking, this is going to be my infantry/combined arms drop and will stay away from dedicated Warjack spam. Of those kinds of lists, the thing that the Four Huge list struggles with the most are units with Shield Wall and Steady, or units with Iron Zeal in general, as the War Wagons cannot knock those models down with their big guns. Further, they aren't likely to kill the non-initial target with blast damage either, which means that you're investing your massive War Wagon shot into killing one single-box trooper. The Sea King's ranged weapon, on the other hand, is perfect for dealing with those kind of units. You get two 3" AOEs of continuous corrosion out of it, and since Shield Wall players like to put their unit into groups of three this almost always mean you corrode between three and six models with a single shot. Further, it has Poison which means the POW 7 blast damage has a reasonable chance to break ARM 18 with three dice and even better if you decide to boost on any of the damage rolls. With Grim's feat, you are almost guaranteed to get two rounds of shooting with the Sea King before it goes in to kill something, and I have found that if your colossal/gargantuan isn't contributing for 2-3 turns of shooting before engaging, it is not earning it's place in the list. The other thing that is unique to the Sea King is the anchor. A 4 inch reach weapon is quite a bit more than the extra two inches of threat range. First of all, it allows the Sea King to reach models behind obstructions or obstacles that other huge bases would be unable to get at. Second, it gives you a little counterplay to things like Stranglehold or effects that cause you to sacrifice movement or action by just letting him influence a bigger sphere of the table. A Sea king can threaten most of a zone without moving if it is already embedded in the zone. One other distinct advantage the four inch melee weapon has is the interaction with Grim's feat. If the Sea King is at max melee range with a target under Grim's feat, then the target either has to be speed 6 with 1" reach, speed 5 with 2" reach, or some combination of things that is faster than that in order to retaliate on the Sea King the following turn. Many heavies don't fit into either category, and even if they do they often either have a system crippled or are knocked down due to the Critical Knockdown effect on the anchor. Finally, the Anchor "retracts" to two inch range when the Sea King is done with it's activation, which means that whatever you were hitting is no longer engaged. This can solve some order of activation issues with the rest of your list, as occasionally the Sea King needs to move before the other huge bases but you still want to use them to shoot at something. With arcing fire, the War Wagons can shoot over the King and not suffer the model in melee penalty. In short, I do not think this is a replaceable model. The other two Kings will perform sub-optimally for what this list is trying to do when compared with the Sea King. This is the main model that people want to replace when they look at this list, which is perfectly understandable. Unfortunately, there are no real analogues for the third huge base when it comes to the rest of the models allowed in theme. Replacing it with a Bomber requires a cut somewhere else to make the points work, and the Bomber is both slower and easier to kill/control than the Hauler. The Bomber also interacts poorly with terrain whereas the Hooch Hauler has pathfinder. Furthermore, the Hooch Hauler is primarily here to help control the aforementioned shield wall/iron zeal/high arm and steady units with a lot of fire templates. Also, interestingly enough, it hits just about as hard as a Bomber at range. Against an ARM 20 target, the Bomber does two boosted POW 16s at approximately 6 damage per shot for a total of 12 damage. The Hauler does a boosted 16 for approximately 6 and two boosted 12s for between four and five damage for a total of 10-11. If the Fire does not go out the next turn, that increases by another 2 or 3 for a total of 12-15 damage. Further, the Hauler does boosted blast damage innately thanks to Oil, whereas the Bomber would have to force for that privilege. I am of the opinion that the Hooch Hauler is not replaceable by anything else allowed in the theme force at the moment. - Passage is a huge problem for this list, but Interdiction, Guardians, and Faithful Masses should be okay. - Once you kill the Kovniks, Legion of Steel cannot keep up with you. Wolves of Winter probably cannot kill all of your huge bases effectively, and I cannot speak to Armored Corps yet, it's too new. - The Knockdown shots are extremely potent into Dark Host, Grims Feat and Marked for Death help mitigate the high DEF of Satyxis, and infantry in general struggle into War Wagons. - The damage output tends to not be high enough to kill your models before you can secure an attrition win. Gorman, if he is in the list, is a high priority target. - Cygnar heavies are squishy enough to kill with the battle engines, Storm Division and Grave Diggers do not really have the output at the threat ranges needed to pressure the list terribly much. - War Wagons make Bump in the Night sad. I am sure there are many other good matchups for this list, but I have too few games with it to truly comment yet. Also, and this is important, none of the above games are truly lopsided in Grims favor. I'm aiming for 50-55% games here since that's about the best you can do at the moment. As with most things, there are matchups you want to avoid with this list. These tend to be Warjack spam lists, casters with Telekinesis, lists with easy access to blind such as Morghoul 2 and Morghoul 3, The Witch Coven and Syvestro. It also really hates playing into steady heavies, and I could see Oracles of Annihilation with Neraphs and Angelius' everywhere being a problem. 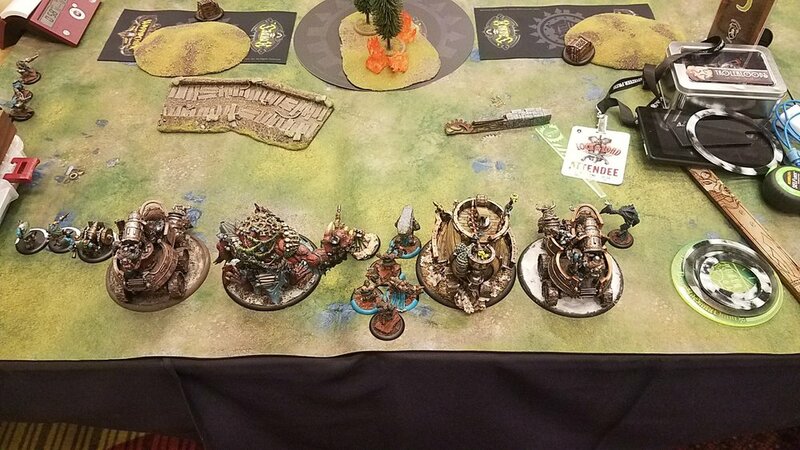 A lot of these matchups are not so bad that they cannot be played, as Grim always has the option of shoving huge bases into your opponents army, feating, and then trying to win on Scenario very quickly, but it is difficult and requires judgement of when that is the correct decision. You get to go first with this list over 60% of the time thanks to the +1 from the theme, and that is a huge deal. By running full speed turn 1, the Battle Engines all sit on the 21 inch line and threaten two inches into your opponents deployment line on turn 2. Grim can often run this turn and put Fury into the Krielstone so that he is in an optimal position to feat on turn 2. If he runs, he is on the 19 inch line, threatening one inch into the opposing deployment zone with his feat on turn 2 if he walks. Against lists with guns, Return Fire is going to go on your War Wagons every single turn after turn 1. The threat of Quake guns targeting models that haven't activated yet can just end your opponents ability to project threat with ranged weapons at all. If you have the Fury, put it on the Sea King next, and the Hauler last. Often, your opponent will take the side of the table with a trench or a wall when they go second, but this often doesn't matter against the Four Huge list. Weald Secrets lets your War Wagons ignore this bonus, and Mantrap doesn't require a direct hit in order to knock down Warrior models. One of my favorite tricks is to ambush the Pyg Lookouts, run one next to something important I want to knockdown (like a high DEF command attachment for example) and then Mantrap the Pyg to knock the enemy warrior down for easy kills. The Runebearer should always either be casting Mantrap or Return Fire in this list, I rarely use him for Harmonious Exaltation. The Pyg Lookouts almost always ambush on turn 2, and they rarely fail to kill what they are going after. When they ambush, you can usually place them in the back arc of whatever they are going after. One can usually aim, and another can walk up to Mark the Target. This makes the aiming model effectively RAT 10 POW 11, which will kill most infantry in the game. 2-3 shots will kill most solos or CAs in the game. Use these guys to deal with pesky models like Iron Fang Kovniks, Fell Caller Heroes, Command Attachments, Caster Attachments, flanking Artillery pieces, etc. They threaten 19 inches from either table edge, it's very difficult to get away from these guys. Turn 2, you either want to feat, catch most of their army and kill a LOT of guys, or if your opponent has played very conservatively I often hold my feat and move Grim into a better position. Set up to score your own scenario elements. This list really likes Spread the Net, Standoff, and Mirage because a top of two feat from Grim often means scoring one or more points. Speed 5 models under Grims feat only run 4 inches - it's very hard to contest with those kind of stats. If you can score on your opponents second turn, it is very hard to get behind. Try to get a melee alpha with the Sea King on an opposing heavy under Feat if you can, and if you can't make sure it contributes with it's gun for multiple turns of shooting before it commits (obviously every game is different, this is just a general rule). This list likes to take the game pretty long, and it will usually win on either Scenario or turn 7. There are VERY few ways to change this list. Everything more or less fits where it needs to and the customization options are not particularly good in this theme. That being said, I am strongly considering dropping the Thumper Crew and Feralgeist, making the Krielstone CA free, and adding a Bog Trog Mistspeaker to the list. I have seen a lot of Blind effects floating around, and I really hate having a dead Battle Engine for an entire round. The list gets much, much worse when one of them is out of commission. Furthermore, this would let it play better into cloudwall armies. I hesitate for two reasons. First of all, it loses a unit which makes your scenario game much, much worse. Secondly, the Thumper Crew has been steadily performing better and better as I learn to use it properly. It regularly kills or dislodges more than you expect it to and I am loathe to give up a source of Knockdown and damage. I will be playtesting both in preparation for Attack-X and WMW, as I do not see myself straying from this particular list in the near future - it's too much fun! See? He looks like he's having fun right? This is a very strong list, and it has a lot of good matchups. It is insanely pilot intensive though, and not messing yourself up with the huge bases takes a lot of practice. I feel like this list takes advantage of every piece of Grim's toolkit and has a very high skill ceiling. I'm incredibly excited to keep playing it going forward. As always, thanks for reading! I'm trying out some new stuff with articles now, especially with the cross linking to Warmachine University. I'd love your feedback on that feature as it adds a lot of time to each article. If you would like to support loswarmachine or Warmachine University, you can do so by becoming a patron! Check it out at patreon.com/loswarmachine.